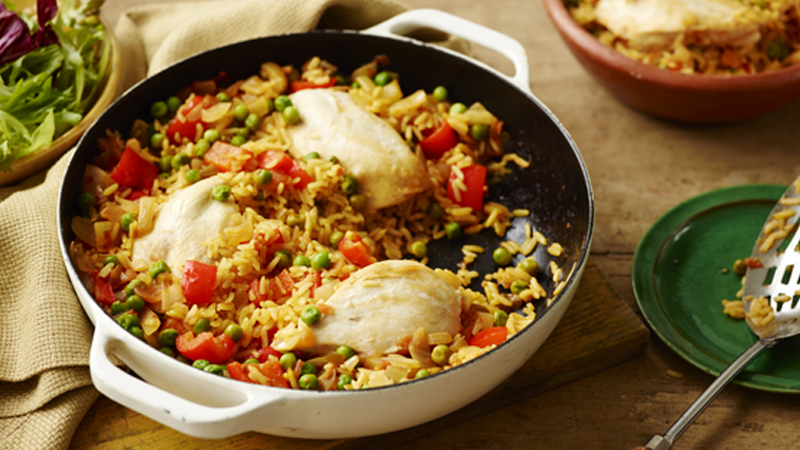 A simple one pan dinner, combining chicken, rice and vegetables. 1. Heat half of the oil in a shallow flameproof casserole dish (or heavy-based frying pan), to medium, and cook the chicken for 5 minutes, turning, once, until golden. Remove and place to one side. 2. Heat the remaining oil in the dish and cook the onion and pepper for 5 minutes. Add the rice, cumin and saffron and continue to cook for 2 minutes before stirring in the chicken stock and salsa. Bring to the boil and cook for 5 minutes. Place the chicken back into the pan with the peas, turn the heat down to low, cover and cook for 15 minutes. 3. Remove from the heat and leave to rest for 5 minutes, before removing the lid and serving. Alternatively use pork loin steaks instead of chicken breasts. Add in more vegetables when cooking the onion and pepper. Why not try chopped courgette or carrot.